Barack Obama is not a Muslim. You'd never know it from a tour around extremist websites and blogs or by listening to some talk radio. But, let's be clear about the facts of Obama's religion--and this is not about supporting/endorsing him or any other candidate, this is about being true to the facts, about living in reality. This is also not about bashing people who do adhere to the canons of Islam. This is about Obama and the faith that is his. Obama is a professed Christian. "And during the course of that sermon, he introduced me to someone named Jesus Christ. I learned that my sins could be redeemed. I learned that those things I was too weak to accomplish myself, He would accomplish with me if I placed my trust in Him. "And in time, I came to see faith as more than just a comfort to the weary or a hedge against death, but rather as an active, palpable agent in the world and in my own life. It was because of these new found understandings that I was finally able to walk down the aisle of Trinity one day and affirm my Christian faith. Barack Obama is not and has never been a Muslim. Obama never prayed in a mosque. He has never been a Muslim, was not raised a Muslim, and is a committed Christian who attends the United Church of Christ in Chicago. Vote against him if you want. Work for another candidate if that is your decision. Argue with his positions and policies. Decry his voting record. Question his ability. But, don't buy into the untruth some are spreading about his personal faith. The high cost of pay day loans. . .
Not long ago I received the following report from the Center for Public Policy Priorities in Austin, Texas. If you don't know CPPP, you need to, especially if you care about the challenges facing marginalized, low-income individuals and communities. Check out their website at: http://www.cppp.org/research.php?aid=754. This particular report deals with predatory lenders and the impact of so-called "payday loans" on the poor in Texas. This is a case of our state needing to regulate an industry that is oppressing the already oppressed. People of faith should speak up clearly and often. It’s the American Dream that if you work hard you get ahead. But with the high cost of living these days, that isn’t always the case. Sometimes families run short of cash and turn to payday loans—short-term loans that give Texans a cash advance on their paychecks, Social Security payments, or veteran’s benefits. Millions of families use these loans when they are short of cash, but the high cost outweighs the convenience. Interest rates start at 400 percent APR and can surpass 1,000 percent, and it is typical for a worker to pay $180 in interest on a 10-day, $700 loan. More often than not, the individual is unable to repay the full amount within the short repayment period, and the debt balloons. In fact, most payday lending volume comes from individuals forced by the cost of the original loan to take out another and another. We’ve seen the devastating impact of subprime lending on the economy. But what do payday loans cost families and communities in Texas? A recent study by the national Brookings Institution calculates the financial impact of payday lending on Austin, Dallas, El Paso, Houston, Fort Worth, and San Antonio. In these Texas cities alone, unregulated payday outfits lent $1.14 billion in 2006. Statewide, these outfits lent at least $2 billion. To obtain these cash advances, working Texans paid at least $400 million in interest and fees, not to mention bank overdraft fees and credit costs ensuing from brutal collection practices. In other words, each year, payday loans cost Texas families nearly double what the state sets aside for financial aid so that aspiring students can attend higher education. To view fact sheets for the six Texas cities, visit http://www.cppp.org/research.php?aid=754. 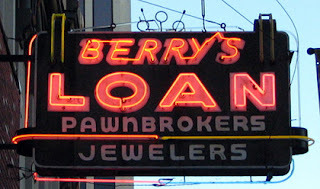 Responsible lenders offer better options than payday loans. Several credit unions and banks are now offering short-term loans at a fraction of the cost of a payday loan. The FDIC is also partnering with three Texas banks in a two-year pilot project to identify best practices in affordable small-dollar loan programs that can be replicated by other financial institutions. These banks include Main Street Bank (Kingswood), Amarillo National Bank (Amarillo), and Liberty National Bank (Paris). Responsible lending needs to be encouraged. at Risk and Flout Texas Usury Laws (Aug. 2005) at http://www.cppp.org/research.php?aid=443&cid=2&scid=2. What should be done? Any ideas? 1) Is this true? Do you agree? Why or why not? 2) If it is true, what does this statement imply or suggest? 3) If it is not true, what does that say about work and its value in view of the traditional high regard with which we have always held it? 4) If you were making a speech on work and advancing economic progress among the poor, would you ever use such a line? Why or why not? 5) If you wouldn't, what line would you put in its place? Obesity and poverty. . . Diet and nutrition continue to be incredible challenges for people who don't have much money. On the one hand, access to affordable and healthy food products remains very limited in many inner city neighborhoods in Dallas simply because there are almost no full-service grocery markets. On the other, the food products that prove to be affordable and available usually turn out to be very unhealthy. Our Community Health Services clinic recently prepared a report on a segment of its patients battling dietary challenges that are resulting in dangerous health status outcomes. Of the 1,291 patients screened. . .
. . .14 were underweight. . . .187 were judged at a healthy weight. . . .391 were overweight. . . .571 were obese. . . .128 were very obese. Terrifying results from a public health standpoint. Income levels dramatically affect health outcomes, as do neighborhood environments and resources. So, how do we change things? What do you think? Recently, I received a report on our summer lunch and reading program. We call it "Nurture, Knowledge and Nutrition." Thanks to funding from the U. S. Department of Agriculture, Central Dallas Ministries provided lunch, healthy snacks and reading resources to 130 program sites all across our side of the Metroplex during summer 2007. The program reach was wide indeed, stretching across Dallas and extending from Denton on the north to Duncanville on the south. Over 9,000 children received the benefit of this fairly massive effort. Even though I thought I pretty well knew the ins and outs of this initiative, the report I received shocked me. We were provided a break down of the percentage of children in each area served who qualify for the free and reduced lunch program offered in our public schools. The average percentage of eligible children for our 130 areas was 85.6%. Of course, many areas reported percentages in the upper 90s. A couple of areas reported 100% of the children qualifying for the food benefit. 1) Poverty is wide-spread in the Dallas area. 2) Poverty is concentrated, severely so in many areas. 3) The overall wealth of our city and our region is not translating into economic well-being for thousands of children and their parents. 4) We are only touching a small percentage of the children who need to receive the benefits of these resources. We are now planning a concerted effort to register other community sites for next summer so that the benefit can spread. That said, we obviously need better, long term, systemic solutions to this deeply entrenched poverty. As important as providing a healthy might be, we must do more and we must focus on different, more challening matters if we want the children to find hope and better lives. What follows are the lyrics to a rather agitating song that speaks of Christmas. As I read it again, it seems to fit well as a Lenten meditation. Possibly we are better equipped to consider it during this season of reflection and repentance than at Christmas. They call him by the "Prince of Peace"
And they call him by "The Saviour"
An unsettling blessing. . .
Every year The Dallas Morning News names its "Texan of the Year." Usually the editorial board selects some notable or news making individual. This year's choice was a shocker. 2007 Dallas Morning News Texan of the Year: The Illegal Immigrant. He is at the heart of a great culture war in Texas – and the nation, credited with bringing us prosperity and blamed for abusing our resources. How should we deal with this stranger among us? He breaks the law by his very presence. He hustles to do hard work many Americans won't, at least not at the low wages he accepts. The American consumer economy depends on him. America as we have known it for generations may not survive him. . . .
We can't seem to live with him and his family, and if we can live without him, nobody's figured out how. . . . Given the public mood, there seems to be little middle ground in debate over illegal immigrants. Spectacular fights over their presence broke out across Texas this year, adding to the national pressure cooker as only Texas can. To their champions, illegal immigrants are decent, hardworking people who, like generations of European immigrants before them, just want to do better for their families and who contribute to America's prosperity. They must endure hatred and abuse by those of us who want the benefits of cheap labor but not the presence of illegal immigrants. Especially here in Texas, his strong back and willing heart help form the cornerstone of our daily lives, in ways that many of us do not, or will not, see. The illegal immigrant is the waiter serving margaritas at our restaurant table, the cook preparing our enchiladas. He works grueling hours at a meatpacking plant, carving up carcasses of cattle for our barbecue (he also picks the lettuce for our burgers). He builds our houses and cuts our grass. She cleans our homes and takes care of our children. Yet to those who want them sent home, illegal immigrants are essentially lawbreakers who violate the nation's borders. They use public resources – schools, hospitals – to which they aren't entitled and expect to be served in a foreign language. They're rapidly changing Texas neighborhoods, cities and culture, and not always for the better. Those who object get tagged as racists. Whatever and whoever else the illegal immigrant is, everybody has felt the tidal wave of his presence. According to an analysis of government data by the Washington-based Center for Immigration Studies, Texas' immigrant population has jumped a whopping 32.7 percent since 2000, a period in which immigration to the United States has exceeded, in sheer numbers, all previous historical eras. Half the immigrants in the state – 7 percent of all Texans – are estimated to be here illegally. Though many would agree that the status quo cannot be sustained – more illegal immigrants arrive each year than legal ones, a sure sign that the system is a joke – neither Texas nor the nation seemed nearer in 2007 to resolving this complex crisis. We can't deport 12 million people who already live here, but we can't leave our back door open indefinitely. Compromise comes hard because the issue is tangled up with the most basic aspects of everyday life, down to the core of what it means to be American. . . .
Read the entire essay at: http://www. Yesterday, I attended a very useful conference sponsored by the National Council of Jewish Women--Greater Dallas Section. It was most instructive to hear a wide range of public officials and leaders, including Mayor Tom Leppert, County Commissioner Maurine Dickey, DISD Superintendent Michael Hinojosa and D Magazine publisher Wick Allison--a group covering a fairly wide political spectrum--all agree that our nation needs comprehensive immigration reform. All called for the provision of a clear track to citizenship for undocumented persons currently living in the country. All were critical of local government bodies and law enforcement taking on this issue without clear public policy support from the federal government. At last, voices of reason! Several of these leaders also denounced the silly idea of building a fence. I loved Mr. Allison's line harkening back to what Ronald Reagan once said about the Berlin Wall, "Mr. Bush don't build that wall!" Clearly, most Americans favor reform that provides current immigrants an authorized way to stay in the U. S.--on the order of about 2 to 1. Politicizing the issue has only served to bring out extreme spokespersons, as has been the case in our nation's past. Dr. Hinajosa made a compelling argument for developing an education track for immigrant youth to be trained as public school teachers who could then fill the hundreds of positions needing bi-lingual instructors. I've always wondered why we Anglos didn't insist that our schools teach everyone Spanish. Students working on two languages together might actually help one another and build a stronger America. And, in the process, they would eliminate the need for Spanish classes in college. Everyone could study French, Chinese, Russian, Farsi or Classical Greek! Why so faithless about our neighbors? For a number of years we have been considering expanding our community development efforts into Austin, Texas. The capitol of our state and home to one of the nation's major universities, the University of Texas, Austin is a key city in many respects. We considered very seriously undertaking this venture about four or five years ago, just after we expanded into San Antonio. Today Urban Connection--San Antonio is flourishing under the leadership of Leslie Kelsie-Grubbs and her team. Now seems the time to expand into Austin as Urban Connection--Austin. As in the case of San Antonio, our key first step was finding a leader up to the challenge. Dean Smith is that leader. We are excited to see our beginning efforts go well. Take a moment and visit the site at the end of the link below. I think you'll be encouraged. If you'd like more details, don't hesitate to contact me. We need support to insure the continuation of our successful beginning. Very few "non-poor" Americans understand contemporary poverty. New York Times columnist, Paul Krugman often speaks to the cruel reality facing those who do know poverty in a personal and immediate way. What he published on Monday, February 18, 2008, should be spread far and wide. What he describes lines up with what we observe and know day-by-day here in inner city Dallas, Texas. “Poverty in early childhood poisons the brain.” That was the opening of an article in Saturday’s Financial Times, summarizing research presented last week at the American Association for the Advancement of Science. As the article explained, neuroscientists have found that “many children growing up in very poor families with low social status experience unhealthy levels of stress hormones, which impair their neural development.” The effect is to impair language development and memory — and hence the ability to escape poverty — for the rest of the child’s life. So now we have another, even more compelling reason to be ashamed about America’s record of failing to fight poverty. Living in or near poverty has always been a form of exile, of being cut off from the larger society. But the distance between the poor and the rest of us is much greater than it was 40 years ago, because most American incomes have risen in real terms while the official poverty line has not. To be poor in America today, even more than in the past, is to be an outcast in your own country. And that, the neuroscientists tell us, is what poisons a child’s brain. America’s failure to make progress in reducing poverty, especially among children, should provoke a lot of soul-searching. Unfortunately, what it often seems to provoke instead is great creativity in making excuses. Some of these excuses take the form of assertions that America’s poor really aren’t all that poor — a claim that always has me wondering whether those making it watched any TV during Hurricane Katrina, or for that matter have ever looked around them while visiting a major American city. Mainly, however, excuses for poverty involve the assertion that the United States is a land of opportunity, a place where people can start out poor, work hard and become rich. But the fact of the matter is that Horatio Alger stories are rare, and stories of people trapped by their parents’ poverty are all too common. According to one recent estimate, American children born to parents in the bottom fourth of the income distribution have almost a 50 percent chance of staying there — and almost a two-thirds chance of remaining stuck if they’re black. Poverty rates are much lower in most European countries than in the United States, mainly because of government programs that help the poor and unlucky. And governments that set their minds to it can reduce poverty. In Britain, the Labor government that came into office in 1997 made reducing poverty a priority — and despite some setbacks, its program of income subsidies and other aid has achieved a great deal. Child poverty, in particular, has been cut in half by the measure that corresponds most closely to the U.S. definition. At the moment it’s hard to imagine anything comparable happening in this country. To their credit — and to the credit of John Edwards, who goaded them into it — both Hillary Clinton and Barack Obama are proposing new initiatives against poverty. But their proposals are modest in scope and far from central to their campaigns. I’m not blaming them for that; if a progressive wins this election, it will be by promising to ease the anxiety of the middle class rather than aiding the poor. And for a variety of reasons, health care, not poverty, should be the first priority of a Democratic administration. But ultimately, let’s hope that the nation turns back to the task it abandoned — that of ending the poverty that still poisons so many American lives. We've edited and added to this post a bit, so that it seemed good to put it up one more time with the "enhancements." If you've already seen the earlier version, just scroll down to the video conversation that Brian provides below. We hope you'll join the crowd this weekend! "You’re invited to gather with a wonderful group of people as part of the Everything Must Change Tour in 2008. Through conversation, presentation, art, music, and reflection, we’ll explore how the way of Jesus can bring transformation in our contemporary world...locally, nationally, and globally... beginning with us, beginning now." You are invited to The Everything Must Change Tour in 2008--Eleven Cities in 2008. Click here to register for this event. A weekend with Brian McLaren and friends: "We Are In Deep Shift"--A time of transition, rethinking, re-imagining, and re-envisioning. A time for asking new questions and seeking answers that are both new and old fresh and seasoned surprising and familiar. What does it mean, in today’s world, to be a follower of God in the way of Jesus? What does it mean to be a faith community engaged in the holistic, integral mission of God in our world today? How do we, as individuals and organizations, respond faithfully to the crises facing our world? What is our duty to God, ourselves, our families, our neighbors, our enemies, and our planet in light of Jesus’ radical message of the kingdom of God? How can we engage in personal formation and theological reformulation for global transformation? Living in "deep shift" can be exhilarating and energizing, but it can also be disorienting and frightening. Deep Shift was created to provide spiritual guidance for organizations. Deep Shift provides support as leaders make their own personal deep shift and guide their organizations through the transition and transformation necessary to ignite the loving energy of people to work for the good of the world: coaching, consulting, and resources for people leading in deep shift — faith community and church leaders, nonprofit leaders, ethical business leaders and others. February 22-23, 2008: Dallas, Texas at Cliff Temple Baptist Church. 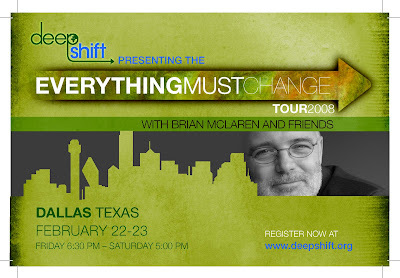 For more details, visit the website at: http://www.deepshift.org/dallas. Catholic Charities, USA recently issued a convicting report entitled, Poverty and Racism: Overlapping Threats to the Common Good. If you care about poverty, its causes and faithful responses, you will defintely want to read it. Part of what makes racism such a difficult issue to address in our nation’s public discourse is that most Americans lack an adequate understanding of how “persistent and destructive” this evil continues to be in contemporary society. Many believe that racism is a matter of the past, conveyed on the grainy images of black and white films. No one disputes that acts of blatant insensitivity still stain our social fabric. Most grant that occasional acts of callous bigotry still occur. But Americans tend to believe that these are isolated incidents and tragic exceptions to the climate of racial decency which now prevails among the majority of Americans in general,and white Americans in particular. At best, this thinking is naive. At worst, it is a delusion and an evasion of reality. We do not dispute that much has changed in race relations since the abolition of slavery and the legal exclusion of persons of color, but we believe that in America we have too often confused the symptoms for the disease and focused on appearances rather than substance. We are convinced that what has happened all too often has been only a covering over, and not a fundamental change in, the racial dynamics of our society. Racism has never been solely or principally about insults, slurs, or exclusion, as demeaning and harmful as these are. 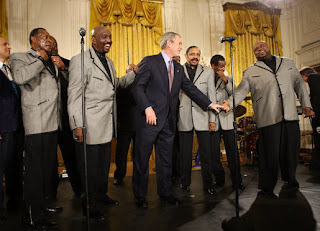 During a White House ceremony on Tuesday of this week, President Bush declared his support for the national celebration of African American History M0nth in the United States. I was fortunate enough to be in my car as he delivered his formal remarks and as he welcomed important leaders to the White House. In view of recent events involving the symbols of racism and race-based hatred, violence and injustice, I found encouragement in the President's words. Let me hear your reactions. Well done, Mr. President and thank you again. Ken Follett weaves a marvelous tale set in 12th century England in his The Pillars of the Earth. Drop in for a moment to witness justice denied to a laboring girl and to see what happens when, just in time, relief arrives. Next, two young men dragged a whole sack of wool up to the counter. The merchant examined it carefully. "It's a full sack, but the quality's poor," he said. "I'll give you a pound." Aliena wondered how he could be so sure the sack was full. Perhaps you could tell with practice. She watched him weigh out a pound of silver pennies. Some monks were approaching with a huge cart piled high with sacks of wool. Aliena decided to get her business done before the monks. She beckoned to Richard, and he dragged their sack of wool off the cart and brought it up to the counter. The merchant examined the wool. "Mixed quality," he said. "Half a pound." "A hundred and twenty pennies," he said. Aliena was horrified. "But you just paid a pound for a sack!" "It's because of the quality." "You paid a pound for poor quality!" "Half a pound," he repeated stubbornly. The monks arrived and crowded the stall, but Aliena was not going to move: her livelihood was at stake, and she was more frightened of destitution than she was of the merchant. "Tell me why," she insisted. "There's nothing wrong with the wool, is there?" "Then give me what you paid those two men." "Why not?" she almost screamed. "Because nobody pays a girl what they would pay a man." She wanted to strangle him. He was offering her less than she had paid. It was outrageous. If she accepted his price, all her work would have been for nothing. Worse than that, her scheme for providing a livelihood for herself and her brother would have failed, and her brief period of independence and self-sufficiency would be over. And why? Because he would not pay a girl the same as he paid a man! The leader of the monks was looking at her. She hated people to stare at her. "Stop staring!" she said rudely. "Just do your business with this godless peasant." "All right," the monk said mildly. He beckoned to his colleagues and they dragged up a sack. . . .
. . . "How many sacks have you got?" said the merchant. A young monk in novice's robes said: "Ten," but the leader said: "No, eleven." The novice looked as if he was inclined to argue, but he said nothing. "That's eleven and a half pounds of silver, plus twelvepence." The merchant began to weigh out the money. "I won't give in," Aliena said to Richard. "We'll take the wool somewhere else--Shiring, perhaps, or Gloucester." "All that way! And what if we can't sell it there?" He was right--they might have the same trouble elsewhere. The real difficulty was that they had no status, no support, no protection. The merchant would not dare to insult the monks, and even the poor peasants could probably cause trouble for him if he dealt unfairly with them, but there was no risk to a man who tried to cheat two children with nobody in the world to help them. The monks were dragging their sacks into the merchant's shed. As each one was stashed, the merchant handed to the chief monk a weighed pound of silver and twelve pennies. When all the sacks were in, there was a bag of silver still on the counter. "That's only ten sacks," said the merchant. "I told you there were only ten," the novice said to the chief monk. "This is the eleventh," said the chief monk, and he put his hand on Aliena's sack. The merchant was equally surprised. "I've offered her half a pound," he said. "I've bought it from her," the monk said. "And I've sold it to you." He nodded to the other monks and they dragged Aliena's sack to the shed. The merchant looked disgruntled, but he handed over the last pound bag and twelve more pennies. The monk gave the money to Aliena. She was dumbstruck. Everything had been going wrong and now this complete stranger had rescued her--after she had been rude to him, too! Richard said: "Thank you for helping us, Father." "Give thanks to God," said the monk. Aliena did not know what to say. She was thrilled. She hugged the money to her chest. How could she thank him? She stared at her savior. He was a small, slight, intense-looking man. His movements were quick and he looked alert, like a small bird with dull plumage but bright eyes. His eyes were blue, in fact. The fringe of hair around his shaved pate was black streaked with gray, but his face was young. Aliena began to realize that he was vaguely familiar. Where had she seen him before? The monk's mind was going along the same path. "You don't remember me, but I know you," he said. "You're the children of Bartholomew, the former earl of Shiring. I know you've suffered great misfortunes, and I'm glad to have a chance to help you. I'll buy your wool anytime." Aliena wanted to kiss him. Not only had he saved her today, he was prepared to guarantee her future! She found her tongue at last. "I don't know how to thank you," she said. "God knows, we need a protector." Well, now you have two," he said. "God and me." Aliena was profoundly moved. "You've saved my life, and I don't even know who you are," she said. Continuing a discussion of the philosophical principles we hold to at Central Dallas Ministries as we do our daily work. . .
Value proposition #2: We believe the resources within a community are adequate to initiate genuine renewal and redevelopment. Obviously, disadvantaged communities cannot enjoy comprehensive renewal and redevelopment without the benefit of new resources that flow in from outside the community. But, we have learned that what is necessary to begin renewal and to sustain redevelopment must spring up from within the community. If the people of a community are not engaged, organized, valued, heard and understood, community renewal will be virtually impossible. Taking it a step further, the very best renewal efforts, and those that are most enduring, emerge from distressed communities where a critical mass of local leaders rise up against their environmental and systemic distress to take matters into their own hands and work for positive change. Just recently we have witnessed such movement again here in Dallas. One of the neighborhoods where we work every day is now organizing against crime, inadequate public services, unresponsive and oppressive retailers, diminishing public transportation services and sub-standard housing conditions. The uprising to call for change grew up among a group of mothers who began talking about how to improve conditions in their community, one of the poorest and toughest in the city. These concerned parents came together around a common agenda: the education of their children. But the concerns soon ran broader for the group. Now after weeks of meetings and several setbacks, they have the attention of housing authority and city officials, including their district's City Council representative. Recognizing that the process will be slow and tedious, the group is determined to keep working. Neighbors like this always seem to make things happen. They lead the way to renewal. Any number of other examples could be provided to illustrate the same principle regarding the benefits of grassroots community organizing. Charitable efforts to "help the poor" often rush past the most important assets in a community in order to get on with agendas developed outside the community of concern. For outsiders, the very best thing to do is show up, observe, listen, make friendships and let processes unfold. Usually, charities aren't that patient, especially when led and formed by "problem solvers." Our Resource Center provides an example of community wealth engaged daily in community problem solving at a very basic level. Of our several hundred volunteers, well over 90% are low-income persons who still use many of our services. But each is making a vital contribution to community improvement through their service. Even more, we rely on them to tell us what we should be doing together. The so-called "poor" provide us focus group and community think tank intelligence as we plot our strategies. While community renewal often calls for massive injections of outside resources, the beginning of authentic progress is almost always rooted in the existing wealth of the community of interest. Most often that wealth takes the form of robust and precious social capital. Wise community developers never dismiss people power. In fact, it is the essential ingredient for any long-term change, hope and rebirth. So, you want to change the world? Looking for your "next step" in crafting the kind of life that will matter? Just getting started with a career and eager to match your personal values with a meaningful response to some of the major challenges facing our society? The Central Dallas Community Development Corporation is seeking highly qualified interns to work directly with the Executive Director on a variety of strategic projects of critical importance to the organization. Upper-division undergraduates and graduate students are encouraged to apply. This is an excellent opportunity for anyone interested in the fields of community development, public policy, urban planning, social enterprise or community service. It is also suitable for students of economics, accounting, statistics, or business, or those planning a career in commercial real estate, who would like to gain experience in community-based, nonprofit real estate development. Download the full Internship Posting here. For years now here at Central Dallas Ministries (CDM), we have operated with a number of philosophical principles in mind as we do our work. I think it is a very good exercise to revisit these principles from time to time in a very deliberate and intentional manner. At the request of a team member here, I will be posting on these "corporate values" over the next few weeks. CDM Value Proposition #1: We believe in the ability of people to solve their own problems when given access to opportunity and resources. One lesson I've learned well across the years is that low-income people are not stupid, lazy or lacking in creativity or native skills. In fact, I've observed that stupidity, laziness and a lack of creativity or skill are personal characteristics that are spread across the entire socio-economic continuum at about the same depth. To use a familiar term from my neighborhood, no one group of people has a monopoly on being "sorry." A corollary lesson is equally clear to me: people don't need me as much as I sometimes think they do. What people really need is not help so much as hope. Hope comes with fair access to opportunity and resources for living. People need to play on a level playing field. People need respect. People need friendship. We all need an occasional round of applause. People need entree and introductions and positive recommendations/references. So many stories come to mind just here. I remember years ago a woman came to our Resource Center with an electric bill that needed to be paid. We were out of funds at the time. The volunteer from our community who visited with her informed her that we had no funds available. But, she made a suggestion to the woman. She told her to go to our little Thrift Store in the back of our building and take advantage of the big sale that was underway. At the time you could buy a large garbage bag of clothing for $1.00--all the clothes you could stuff into a bag! Our volunteer counselor, herself a poor woman, went on to suggest a yard sale to help raise the needed funds. As I recall, the woman with the utility bill had $4.00. She bought four bags of clothing. She took the used clothes home, washed and ironed them and organized a yard sale at her house. About two weeks later she returned to report the outcome of her venture to the person who gave her the idea. The sale had produced more than enough to cover the $80.00 utility bill. The neighbor with the now paid bill was ecstatic. Before she left, she purchased more clothing! This woman didn't need us to help her pay the bill really. What she really needed was a plan that she could execute successfully. Our counselor understood that. Across the years we have employed men and women from our community to work in various positions from Community Health Services to the After School Academy to the Resource Center to the LAW Center to General Administration. Relatively unskilled, heretofore low-income workers fill important positions here at CDM. Access to opportunity is the key, not being "helped." We've observed the same phenomenon recently among our Destination Home participants. These are men and women who move from the streets of Dallas directly into decent, high-quality housing that we provide. Certainly, we are providing these great folks a bit of a "hand up," but they in turn are partnering with us to create a workable, healthy community. We've seen it among the students we train in construction and hazmat remediation skills for the building trades. We've noticed it in our SAT prep classes for high school students, as well as in our scholarship programs. In short, people don't need me as much as I might like to think. What they need is a chance. If you haven't been to the site, drop what you're doing--as in stop reading my page right now!--and take a look at http://www.dontalmostgive.org/. I think you'll find your visit a moving experience. Once you've been there, give something. . .somewhere. . .today. You can make a difference in a life that needs what you have to offer. A different kind of religion. . .
Shout! A full-throated shout! Hold nothing back—a trumpet-blast shout! They ask me, "What's the right thing to do?" "Why do we fast and you don't look our way? Why do we humble ourselves and you don't even notice?" The bottom line on your "fast days" is profit. won't get your prayers off the ground. You'll call out for help and I'll say, "Here I am." Received a gracious message from a friend in the housing design industry about the op-ed piece published in the Dallas Morning News about the celebration of Martin Luther King, Jr. Day and the whole idea of hooking it to volunteerism. "And did you notice how many times the DMN/ others referred to the MLK 'Parade'? I was hung by my ears by a friend in San Antonio when I referred to the MARCH as a parade. However, it seems that it has now become more of a parade / festive holiday. "And one humorous side note. 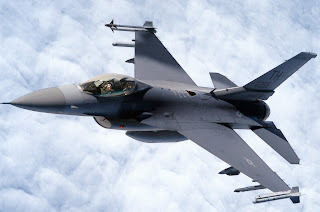 A lot of stink was raised a few years ago in San Antonio when someone went to a lot of trouble to arrange an Air Force fighter jet fly over the march/parade route honoring a man of non-violent protest." Words signify meaning, interpretation, expectation and direction. Important symbols that need to be chosen carefully. Jet fighter planes honoring Dr. King? Strange how our choices and actions so often co-opt truth, especially when that truth calls us to account. Yesterday, at our monthly Urban Engagement Book Club, we unpacked Dowell Myers' book, Immigrants and Boomers: Forging a New Social Contract for the Future of America (Russell Sage Foundation, 2007). Dowell Myers is professor of urban planning and demography in the School of Policy, Planning, and Development, at the University of Southern California. He directs the school’s Population Dynamics Research Group, whose recent projects have been funded by the National Institute of Health, the Haynes Foundation, Fannie Mae Foundation, and the Ford Foundation. Of particular note, Dr. Myers leads the ongoing USC California Demographic Futures research project. Myers has focused on the upward mobility of immigrants to the US and Southern California, trajectories into homeownership, changing transportation behavior, education and labor force trends, and projections for the future of the California population. Well-known as a specialist in demographic trends and their relation to all areas of policy and planning, Dr. Myers has been a longstanding advisor to the United States Census Bureau and is the author of the most widely referenced text on census analysis. Myers earned his Ph.D. in urban planning from MIT and he also studied demography and sociology at Harvard University. Professor Myers makes it very clear that when it comes to the heated national immigration debate currently underway, he "felt compelled to rush to the middle, planting my flag in the place of commonality where it seemed many neglected interests overlapped (p. xiii)." Myers' thesis is practical and demographically undeniable. Basically, he says that America needs immigrants, the ones who are here now. And, America needs to keep them here and educate their children so that a new "intergenerational social contract" can be formed. As the Baby Boomers age (there are two kinds of Americans: those who are old and those who are growing old), an obvious question is who will take care of them and who will be educated enough to enjoy the kinds of jobs that will allow the next generation to buy the houses of the Boomers? "The key step in breaking the current impasse is to see ourselves in a longer time perspective. . . . The great tragedy is that many of us fail to recognize how dependent we are on the rising new majority who will supply the workers, the taxpayers, and the home buyers. When we vote to undercut this group, how much are we undercutting our own future? (pages 8, 11)"
"Important to older homeowners is protecting the value of their homes as assets either to draw upon for retirement income support or to sell outright. It is in the interest of homeowners that future home buyers be well educated and have sufficient income to make the price bids desired by home sellers. . . . (p. 14)"
"The elderly will sell many more homes than they buy, and when the giant baby boom generation passes age seventy, a growing rush of sellers will be seeking to cash in their housing investments, whether to move to more comfortable retirement quarters or to draw on their equity for long-term care or retirement support. Should there be a surplus of sellers over buyers in high-priced brackets because the younger generation is not sufficiently educated to hold jobs that would enable them to buy homes in these brackets, downward pressure on prices will erode much of the equity stored in the home values of the elderly. This generational housing bubble could prove far deeper and more long-lasting than the simple downturn following the housing price boom of 2002 to 2005. Thus, the buyer and seller relationship will link the fortunes of different generations, and that linkage will echo a different relationship formed earlier when the older generation supported investment in the education of their future home buyers (p. 253)." On real benefit of funding the education of immirgrant children, Myers is clear: "There are strong grounds for emphasizing a homegrown strategy. There is long-standing and near universal support in the United States for expanding the size of the middle class. A corollary of that goal is reducing poverty and the growing economic polarization that has been widening the gap between the fortunes of higher- and lower-income groups in the United States. A larger middle class would benefit both consumers and businesses and broaden the ranks of the voters and taxpayers at the heart of our democratic society… Over the long haul it is far preferable to educate the children already living in America to become our skilled workers of tomorrow (p. 255)." "Citizens must rely on a shared understanding of a believable and desirable future that can be created. To be effective, this shared vision of the future must address the particular needs and fears of different groups, yet at the same time it must focus on the common purpose and emphasize mutual self-interest. In essence, the shared future is a compromise that citizens can choose to accept or not, but as they assess the alternative visions of the future competing for dominance, they inevitably will make their choice. The dominant alternative today, or course, is the vision of a future of despair (p. 257)." In my view, and Myers seems to confirm it, opponents of comprehensive immigration reform, like that suggested by President Bush that provides a way for the 12 million+ unauthorized immigrants to remain in the United States, simply aren't considering several extremely practical factors. They surely are not taking a long range view of our alternatives as a people. We always seem to discover hope when we work together to include everyone. Dispair flourishes when we seek only to exclude. 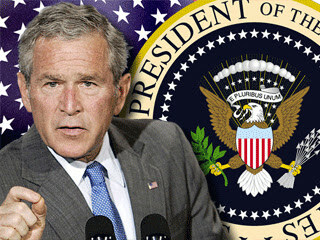 President Bush unveiled his proposed budget, another recording setting development: the largest budget in our nation's history totals $3.1 trillion. The plan seeks to cut spending on Medicare and Medicaid, boosts military spending and projects the deficit this year and next will hit near-record levels. Pentagon spending would rise 7.5 per cent to $515 billion, the 11th consecutive year of increases. Programs in the departments of education, interior, transportation, justice and agriculture would be reduced. The nation's budget deficit will reach $410 billion this year, up from a $162 billion deficit in the last federal budget, even with the suggested cuts in major social and community development programs. The $3.1-trillion budget represents a 6 per cent increase from estimated spending of $2.93 trillion for the year that ends Sept. 30, 2008. The White House maintains the budget would have a surplus of $48-billion in 2012 if adopted. As in previous years, the Administration’s proposed budget represents significant cuts to low income housing programs. The President cites “turbulence” in the U.S. housing market as a core issue to be addressed in the FY09 federal budget; nonetheless, the proposed budget weakens programs that assist the lowest income people find and keep affordable housing. One of the most effective housing resources for low-income, working families, the Housing Choice Voucher program, is under funded in the proposed budget by about $1.5 billion if the nation's goal is to fund simple renewals for the vouchers and not grow the program. According to the Center on Budget and Policy Priorities, this will mean a loss of 100,000 vouchers currently in use nationwide. In addition, several other programs for low-income and disabled persons will be eliminated completely. As he has for the past several years, President Bush again proposes to eliminate the HOPE VI program that provides for the renovation and dispersion of public housing developments like we have witnessed at Roseland Homes where we have been working since 1996. The HOPE VI program has been an effective community redevelopment catalyst for several key neighborhoods here in Dallas. The Community Development Fund receives a $900 million cut, with the Community Development Block Grant (CDBG) program receiving an 18 percent, or $659 million, cut. Cities like Dallas use these funds to encourage economic and community development initiatives in low-income neighborhoods. 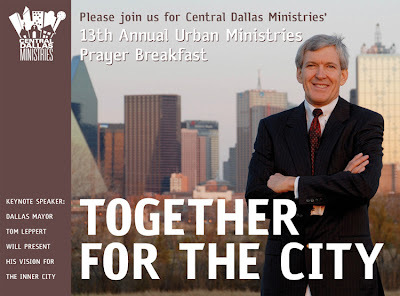 This year Central Dallas Ministries will receive almost $1 million in CDBG funds for use in our downtown affordable housing development, citywalk @akard, and for employment training efforts. The President's budget requests a 27% cut to Section 202 housing for the elderly, and a 32% cut to Section 811 housing for people with disabilities. Several news tidbits stuck with me from last week. The Department of Labor reported a net loss of 17,000 jobs for the last month, a marked change in the direction of that indicator that has been trending up for the past four years or so. That fact, plus the sub-prime mortgage and housing market crisis, indicates the U. S. economy is really slowing. The U. S. and most foreign stock markets reflect the same reality. Tough news for low-income families who likely will be joined nearer the bottom of our economy by a crowd of previously middle-income families. In the past month I've had several conversations with people who have either lost their homes or fear they may. I fear we will begin to see even more growth in the numbers of Americans who fall into poverty. ExxonMobil reported historic, all-time record earnings for an American corporation in the last quarter. The data point that sticks with me: the company earned $1,300 per second in the reporting period. Last Tuesday's edition of The Wall Street Journal published a frontpage article on the connection between head injuries and various social issues ( "Studies Cite Head Injuries As Factor in Some Social Ills," by Thomas M.Burton, A1, January 29, 2008). It seems that medical researchers discern a link between a number of social problems and sometimes long-forgotten head trauma. The list of problems that may be connected to earlier head injuries includes mental illnesses, alcoholism, drug abuse, learning disabilities and chronic homelessness. The U. S. Centers for Disease Control and Prevention estimates that 5.3 million Americans suffer from long-term disabilities that are related to brain injuries. The connection of such social and personal challenges to brain trauma often go unrecognized. Reserachers discovered high incidence of forgotten or unreported head injuries in working with patients dealing with a whole range of behavioral and social problems. The source of head traumas include typlical experiences that occur and are forgotten, such as bike and car accidents, sports-related concussions and childhood accidents or abuse. A research team at the Brain Injury Research Center at Mount Sinai School of Medicine in New York conducted assessments of arouind 100 homeless men in New York City. The study found that 82% of the men reported brain injuries in childhood, primarily due to parental abuse. In an expanded study of public education programs designed for students with learning disabilities, researchers discovered that 50% of the children had suffered some sort of head trauma at some point in their lives. The story reminded me of two conversations I've had with colleagues, one in Seattle and one here in Dallas. During a trip to Seattle to study effective models of permanent supportive housing (thanks to the support of the Corporation for Supportive Housing), I learned that all of the residents in a 75-unit housing development designed for some of the most fragile and expensive homeless persons in the city had experienced head trauma. Here in Dallas, Dr. Joel Feiner, the director of psychiatric services at our VA Hospital, told me that 85% of his homeless patients suffer from post traumatic stress disorder as a result of traumatic experiences prior to their entry into military service. Most were abused as children. The evidence is growing. There are reasons back of the homelessness we observe in our communities. As with just about everything human, kindness and understanding go a long way in leading us toward correct and effective responses to our neighbors who suffer and live in great difficulty through no fault of their own. [The Wall Street Journal article can be read at: http://online.wsj.com/article/SB120156672297223803.html. Follow this link to a Monkey Survey about new ways of "doing church" and connection to the inner city. Spend two minutes on the survey. It will really help me out! We lived in New Orleans from 1975 until 1980. I was attending seminary or doing graduate work at Tulane University the entire time. I also served as minister with a downtown church. It was quite interesting, to say the least! One of my most memorable experiences occurred on Sunday, September 17, 1978. I was invited to serve as chaplain for the New Orleans Saints that day. My assignment included speaking to the team in a devotional setting that morning before the game against the Philadelphia Eagles. It was the third game of the season. The Saints came in at 0-2, having lost their first two games of the year to Minnesota and Green Bay. I ate breakfast with the team that morning. Hank Stram was the head coach, and I was seated at his table. 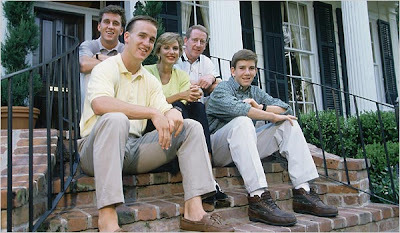 Archie Manning was the star quarterback for a team that couldn't seem to do much better than 7-9 in any year. The chapel service was voluntary, of course. Coach Stram made himself scarce when it was time to begin. 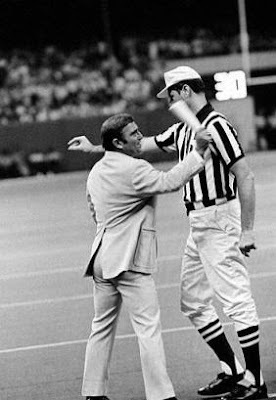 Since those days, things have changed a bit in the National Football League. The team was fairly close knit, a community of fellow strugglers. Player salaries weren't nearly as high as today. The Saints were a motely crew! As I recall, I read Paul's words to the Philippians about "forgetting what is behind and pushing on to what is ahead" or something like that. If laughter means anything positive, then it seemed to work for the players who were there. As a kid who grew up playing and loving football, it was an important experience for me. In my office today you can see a regulation Saints helmet on my wall, a commemoration of that day with the Saints. By the way, they lost the game to the Eagles 24-17. Archie threw for 239 yards before 49,242 screaming Saints fans. And, did I mention that breakfast was amazing? Will you pray for Dallas? will present his vision for the inner city. 7:15 a.m. to 9:00 a.m.